On Sunday 31st May 2009 at last years Balgal Big Weekend the floating pontoon at Fishermans Landing Balgal beach was open by the Mayor and a flurry of politicians. This was warmly greeted by every fisherman as it provided a wonderful amenity that is constant use. Those that read my review of the ramp early last year will not that the pontoon was left resting on the sand at low tide. 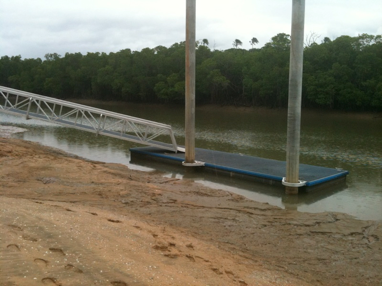 It was unfortunate that the pontoon was placed in such a position, it had to be moved. 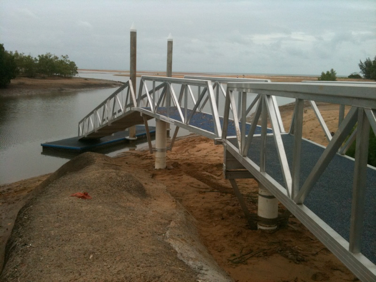 Originally the pontoon was funded by Federal/State government but the cost of the move was picked up by the Fishermans Landing Fishing and Social Club and the company Superior Jetties for which we can thank them. The boys at the landing promised to have the pontoon moved for the Balgal Big Weekend where they are conducting the Tackle World open fishing completion (Friday 21-Sunday 23 check the flyer available here). The move was a major logistical exercise, but well worth the efforts.